Accent Walls Make a Comeback - Columbia Builders, Inc. Accent walls are a great way to inject some personality into your custom home! While searching for interior design ideas to complete your new custom home, consider an accent wall. This is a budget-friendly way to infuse personality into any space in your home, whether you choose to go bright and bold or mix a palette of soft neutral tones. Accent walls add interest and fun to your custom home’s interior design. A can of paint and one free afternoon is all you really need for this do it yourself project. And if you decide after a few years to go with a new color scheme, it is easy and affordable to make the switch. Painting one wall can yield dynamic results with minimal effort and cost. Use the savings to splurge on other design elements for your home! An accent wall gives you the freedom to add a splash of color that might be considered too bold when applied to the whole room. With nearly an unlimited choice when it comes to color, you can pick and choose according to the aesthetic needs of the room and the rest of the decor. Bold and bright not your style? Consider mixing neutral tones, particularly in a bedroom or bath, to create a tranquil retreat. Creating a focal point is one way to utilize an accent wall. While strong colors can provide a striking contrast to an otherwise neutral space, they may also work well to anchor a bed or a unique piece in your room. Elevate your design by looking to the ceiling – an airy and inviting neutral room may be complemented by a coordinating neutral ceiling color. For even more visual interest consider creating a painted pattern on your wall. 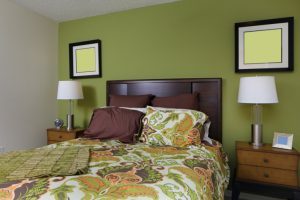 Using color to accent a room can happen in a variety of ways, and paint can be applied to nearly any surface. Painting the inside of a wall unit, bookcase, or even a table or other furniture can give just the right punch of color. For a truly custom look, match the paint to an existing color in your draperies or upholstery. Columbia Builders is the home builder of choice in Howard County, offering homes in Ellicott City, Elkridge, Laurel, Columbia, Marriottsville, Fulton, Clarksville, Dayton, and Brookeville. No matter what the size and scope of your project, we have the skills, experience, and resources needed to bring your vision to life. We offer a level of customization that is truly unmatched and are committed to using materials and craftsmen of the highest quality, so you can trust that your new home is built to last. If you’re ready to invest in a home that is built with your needs in mind, trust in us. Give Columbia Builders a call today at 410-730-0215 or use our contact form here. You can also keep up with us on Facebook, Twitter, Google+, Houzz, and Youtube, and don’t forget to check back on our blog for more tips and information! This entry was posted on Friday, March 23rd, 2018 at 9:35 am. Both comments and pings are currently closed. Don’t Get Left Out in the Heat! © 2019 Columbia Bulders, MHBR# 254. All Rights Reserved.